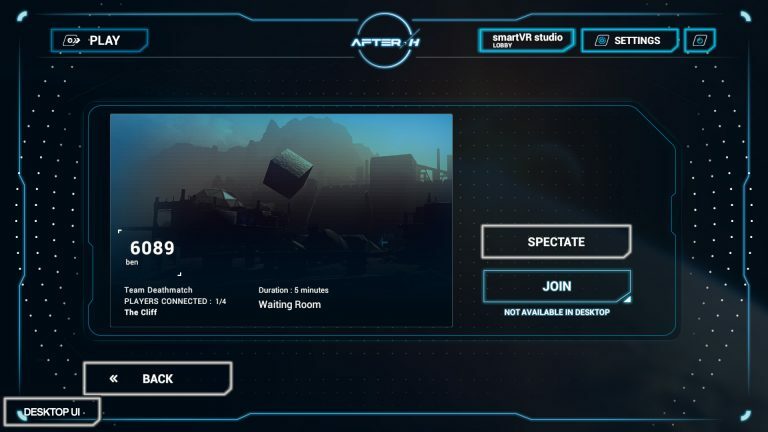 The new version of After-H is now available to download on the smartVR store and accessible with your smartVR launcher. The client is also a good way to stay informed of After-H news and competitions ! Client: The game now includes a client to automatically update the game and provides the last news about After-H and competitions ! Admin: The admin computer doesn’t exist anymore. All players are autonomous. You can still help users with an admin feature (check Arcade Admin part below). French & English: The game is now available in both languages (almost 100% translated). Map : Ruins Bay added (read the post). 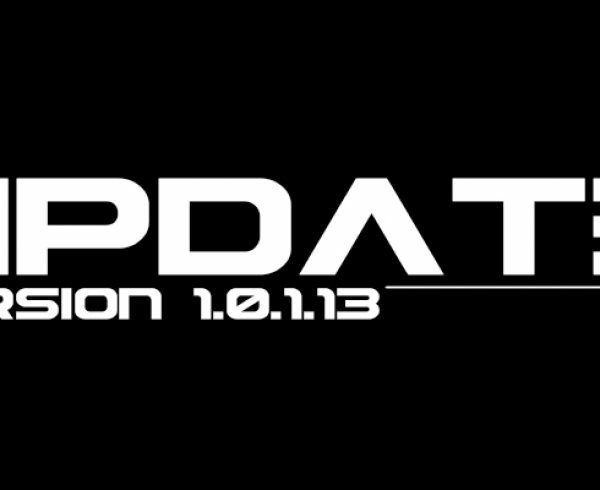 Mode: FFA added (read the post: coming soon). 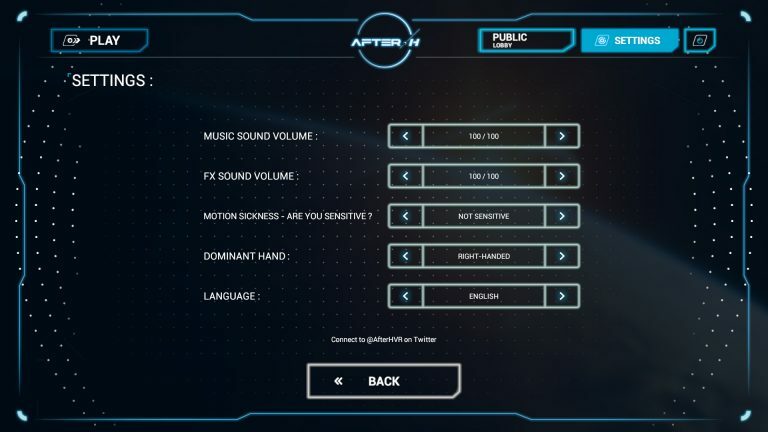 Main menu: We operated a complete rework of UI/UX with a main menu. 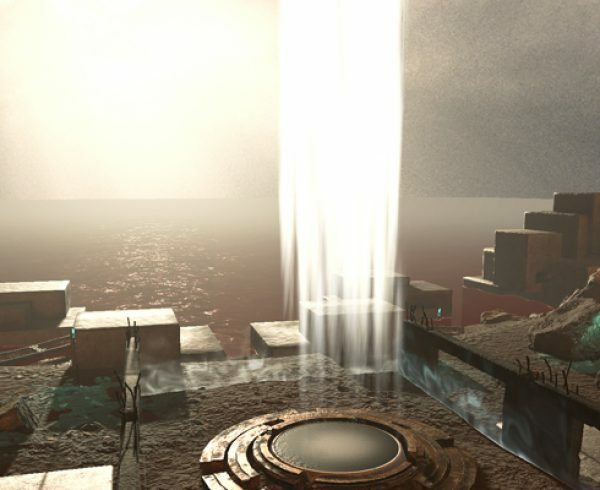 Filters: Players can filter the game using different filters and a search bar. Auto-detect PPGUN/Controllers: After-H now detects automatically if the game is running with PPGUN or Controllers. Left/Right Hand + Size: Calibration of main hand and size directly in the game. Settings: Players has now access to settings to calibrate the game, including Motion Sickness Sensitivity, Sound Volume, Main hand and Language (FR/EN). Next game: To easily continue to play, at the end of the game, all players are bring back to the waiting room. They can reset calibration and name if necessary. 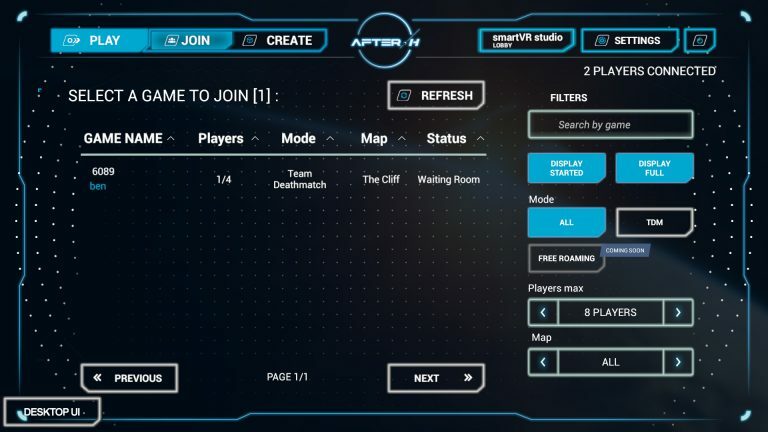 Player team: Players can now choose their team in the waiting room and change when they want. Creator: When a player creates a game, he can set the parameters of the game. Settings can still be updated in the waiting room. Observator – Kill Feed: Observator mode now includes a Kill Feed at the bottom left corner. Observator mode is now fully incorporated in the game. The computer used to observe a game should not have a VR headset connected. On the main menu, select the game you want to spectate, then click on “Spectate”. Desktop/VR Mode: Arcade owners can now, from the computer of the player (or via a computer control software) switch between VR and Desktop view. In “VR view”, admin can see what the player is doing. In “Desktop view”, with your mouse and keyboard, you can control and click for the players in the different menus, allowing you to join/create/change settings; in this mode, the player with the headset can see a message on his screen “Admin is taking control of the computer, please wait”; he also sees what you are doing so he can do it himself the next time. Private lobbies: Arcade owners now have access to a specific lobby dedicated to their place. 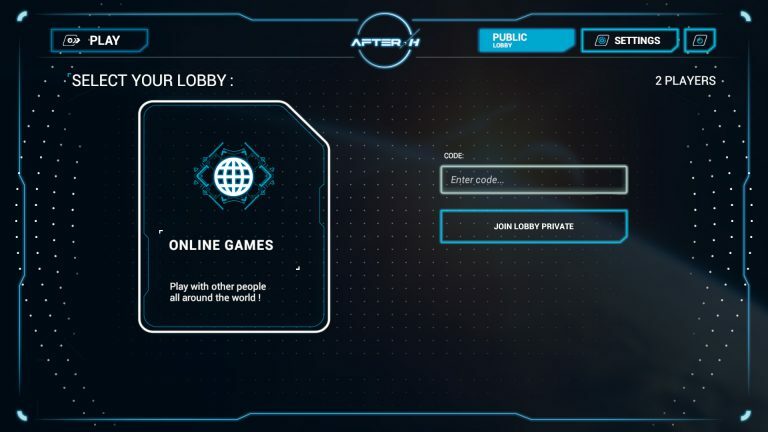 Only people connected to a private lobby can join a game created in this lobby. Contact us to access to your dedicated lobby. “Ready for Battle” sound: This sound doesn’t play two times anymore at the beginning of the game. Spectator update name: Spectator has now always the good player names. Count down for Desktop: Arcade owners now see the count down on the screen of each player when the game is about to start. Multiplayer is now faster: Optimization of the multiplayer messaging system to increase fluidity. Character scaling: Scaling system now works way better! “Stand Straight and push the button calibrate”.